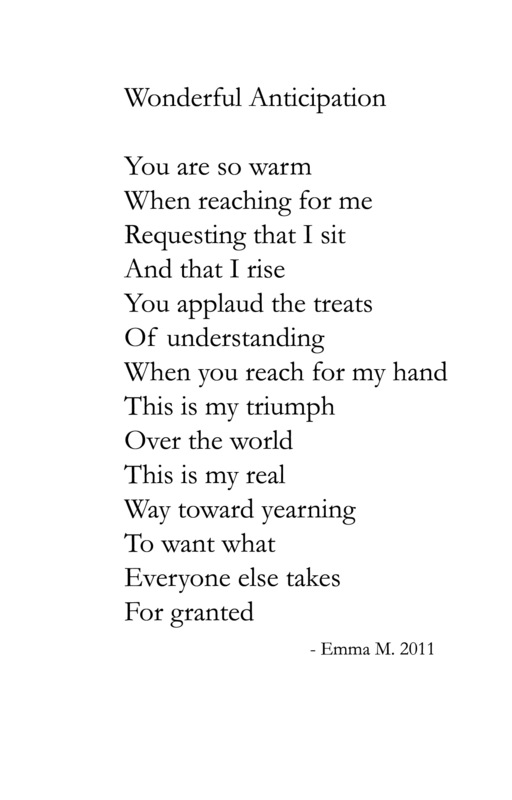 It’s hard to describe how it feels when I take Emma’s hand and she types out a poem. There’s a flow of energy between us that forms a powerful connection. It almost reminds me of that feeling that I had when I held her to my breast as an infant. That may sound strange, but I don’t know how else to explain that feeling of calm that takes place when I can finally sit down with her after a long day. Sometimes it seems like the whole world disappears. At first, I had a hard time with the idea of everyone thinking I might be guiding her hand or manipulating her typing in some way. But I don’t feel any of that anymore. This is just how we communicate and I am so thankful that I can help her have a voice. 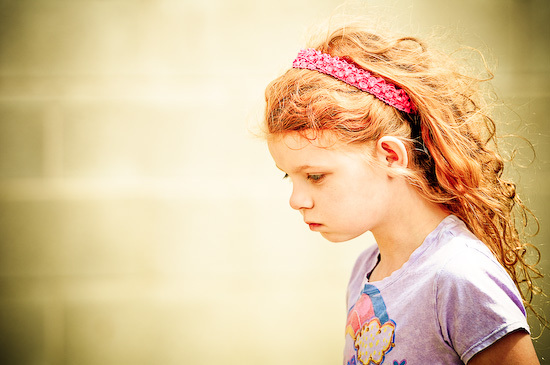 Times are very hard for Emma right now with behaviors that she can’t seem to control; and her deep desire to speak with her mouth is such a huge source of frustration for her. Lately we’ve been butting heads and I’ve been losing my patience with her and screaming at her and then feeling guilty for it. I still have that feeling like I’m never doing enough somehow – like I’m always letting her down. That’s why her latest poem touched me so much. I sat down with her on the couch and as she slowly typed out all the words, my heart just filled up. Because I am the only one she can communicate with, I am the first to hear the joy or pain of her heart, her strongest desires, her dreams, her fears and agitations with me and the world. Some things can be really hard to hear and heavy on my heart. I ache in her pain and delight in her joys. That’s why this poem made my heart smile! With every poem that she types, I feel like a get to know her on a deeper level – like her soul seeps into every word, opening secret windows into her heart and mind that I can peek into at last. And what a beautiful place it is. I just knew that this one was for me. Afterwards she reached out again. I guess she wanted to write it just as badly as I needed to read it! I asked Emma if it was okay if I shared it on the new blog and asked her if she wanted to put a picture with it like we always do. Emma – You are so right: We all do take for granted what is so difficult for you to accomplish. But most of us don’t even notice ourselves, much less everyone else – especially not like you do. Please know that you are very wise and that you see things that so many people never would without your voice to show them. Also – I promise you most kids your age would NEVER notice what makes their moms happy. (Shoot, most people MY age don’t notice that.) You have more empathy, more wisdom and more words worth listening to than most people. And one more thing. I love you. And so does Dia. She really does consider you her best friend. It touches me so deeply that you and your mom are so connected, Emma. She’s a very special mom. That was so beautiful, Emma. I really got choked up! Your silent voice speaks louder than anyone’s voice. You are truly gifted with your poetry and with having such a patient, understanding, and awesome mother. Your voice glitters with clarity and purity. Wow, thanks so much, Anne. It’s wonderful that you are still in touch! I’ll tell Emma what you wrote. You both, mother and daughter are perfect reflections of each other’s and God’s love. Thank you for sharing that love and inspiring the world. Edy, thank you for your wonderful words. I know that it was God’s love that made this whole thing possible. Thank you so much, Emma, for being willing to share this beautiful poem! You have a wonderful way with words! I also love the photo of your mom holding your arm as you write. Thanks so much Kris. I will tell her what you said. I am so thrilled that she is able to express herself this way after all those years!